The Public Forum will be an opportunity for governments, civil society organizations, legislators, trade union representatives, academics, business groups and students to take stock of the latest developments at the global level that are having an impact on the multilateral trading system and identify steps that will contribute towards bolstering international trade flows and strengthening the WTO. The Forum will discuss the importance of the rules-based multilateral system in mitigating the effects of the economic and financial crisis and reflect upon the post-crisis agenda of the WTO. In addition, the Forum will look at the different actors that seek to influence the WTO, assess the factors and issues shaping world trade and brainstorm on the way forward. Civil society representatives interested in organizing a session during the 2010 Public Forum should fill out the Call for Proposals Form before 7 May 2010. 4. 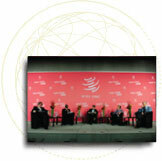 Looking to the future: What post-crisis agenda for the WTO in a shifting-power scenario?